from the New York Times' always reliable, "Recipes for Health"
1. Heat a medium saucepan over medium-high heat, and add the barley. Stir in the pan until the barley begins to smell toasty, about five minutes. Add the stock (or water) and salt, and bring to a boil. Reduce the heat to low, cover and simmer 40 minutes, until the barley is tender. If all of the liquid has not been absorbed, drain. 2. While the barley is simmering, make the vinaigrette. 3. Place the mushrooms in a salad bowl, and toss with 2 tablespoons of the dressing. 4. 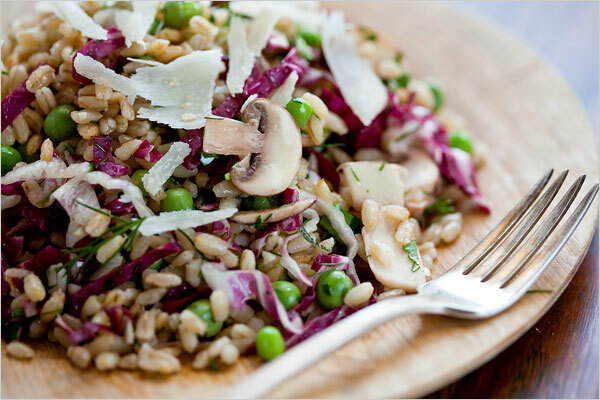 When the barley is ready, add to the salad bowl and toss with the mushrooms and remaining dressing. Add the herbs, peas and radicchio. Serve warm or room temperature, garnishing each serving with shaved Parmesan. Advance preparation: You can make this up to a day ahead, but only add half the mushrooms. Don’t add the peas, herbs or radicchio; toss these ingredients with the salad shortly before serving. Whisk together the lemon juice, vinegar, salt, mustard and garlic. Whisk in the oils, taste and adjust seasonings.